Passengers waited on the platform for a Red line train at the Downtown Crossing station in Boston Friday. Last week Isaac Silberberg had one of those commutes too familiar to weary MBTA riders: After his inbound Green Line trolley left Kenmore Station, it encountered a signal problem and slowed to a crawl. A “minor delay,” the T warned in an alert posted on Twitter. It was anything but. A 1.5-mile stretch to Arlington station took 30 minutes to traverse and left Silberberg and fellow passengers fuming. The lack of precise information is at the root of many riders’ frustration about the delays that plague the MBTA. The agency has significantly improved its communication to riders over the last decade, with text and e-mail alerts, warnings on Twitter, and countdown clocks in stations. But the system sometimes fails to convey the scope of the problems causing delays, and the time estimates can be outright wrong. Moreover, the T’s website provides little information about how it quantifies its three types of delays. Agency officials said a minor delay is when trains are running 10 to 20 minutes behind scheduled intervals; a moderate delay is trains running 20 to 30 minutes behind; and severe is anything over 30 minutes, or one that requires shuttle buses. Each delay, though, is based on the scheduled interval between trains depending on the time of day. If the interval between Red Line trains during rush hour is five minutes, then a minor delay can be as long as 25 minutes; a moderate delay on a midday Orange Line train, with nine-minute intervals, can last 39 minutes. So, by the time the T announces a minor delay, things have already gotten pretty bad. And it can still escalate into a moderate or severe delay if the agency’s initial diagnosis is off. To beleaguered riders on a stuck train, those labels “minor” and “moderate” belie their experience. Compounding the problem are the limitations of the countdown clocks that forecast the arrival of the next train. The maximum time a clock can display is “20+” minutes. The clocks can also be wrong during delays, displaying false arrival times. That was the case during the heavy cold spell during the holidays, when some riders stood on freezing platforms waiting much longer for trains than the clocks forecast. Jeffrey Gonneville, the T’s deputy general manager, said the countdown clocks can “lock up and freeze” when delays cascade across the system, forcing dispatchers to run trains off-schedule. “If you were only looking up at those signs on your platform . . . you were getting inaccurate information,” Transportation Secretary Stephanie Pollack acknowledged at a public meeting earlier this month. At some stations, the T turned the clocks off — but that prompted nearly as much criticism from riders as leaving them on with inaccurate information, Pollack said. It’s not unusual for delays to go from bad to worse. For example, last month the T announced a minor delay due to a disabled train at 6:22 a.m. Nearly 15 minutes later it was upgraded to a moderate delay, and then by 6:50 it was changed to severe. In December alone, at least 16 service alerts escalated from minor to moderate or to severe, according to a Globe review of T data. Some riders say the combination of delays, clock glitches, and lack of clarity about delays leaves them helpless. In addition to text and e-mail alerts, countdown clocks, and warnings on social media, the T has also refashioned its website to emphasize easily digestible updates; riders also have their pick of mobile apps that tell them when the next train or bus will arrive. MBTA officials said passenger surveys rate timely communication about service as highly important, possibly even over service reliability. And research by transit experts has shown that real-time communication leads to increased customer satisfaction. But if that information doesn’t accurately capture riders’ experience, it can undermine the credibility of the entire warning system, said Rich Barone, vice president for transit at the Regional Plan Association in New York City. “If things are continuously inaccurate or ambiguous to people, I think they do turn off after a while,” said Barone, who coauthored a 2014 report on the communication strategies of various transit agencies. Officials said service alerts are primarily for people who have yet to arrive at a station, and not for passengers on stalled trains, who they said are better served by announcements from train operators. But they acknowledge the alerts may not perfectly align with what riders are experiencing. “The delays that are posted give an overall view of what the system or the line is experiencing, but certainly, there could be individual customers or individual trains that are experiencing more of a delay,” said MBTA deputy chief operating officer Todd Johnson. The T is studying how its customers interpret alerts and plans to revamp the system soon. Some ideas include using just two types of delays — moderate or severe, for example — to give riders more warning about what to expect, or having different standards for the severity of a delay during rush hour, according to David Block-Schachter, the T’s chief technology officer. Johnson added that the T used to offer time estimates of train arrivals through text alerts, but those forecasts were unreliable. He said that passengers told the agency they would prefer qualitative descriptions — hence the categories of minor, moderate, and severe. Commuter rail uses time estimates for delayed trains, but that’s easier since the system operates on set schedules rather than changing intervals. 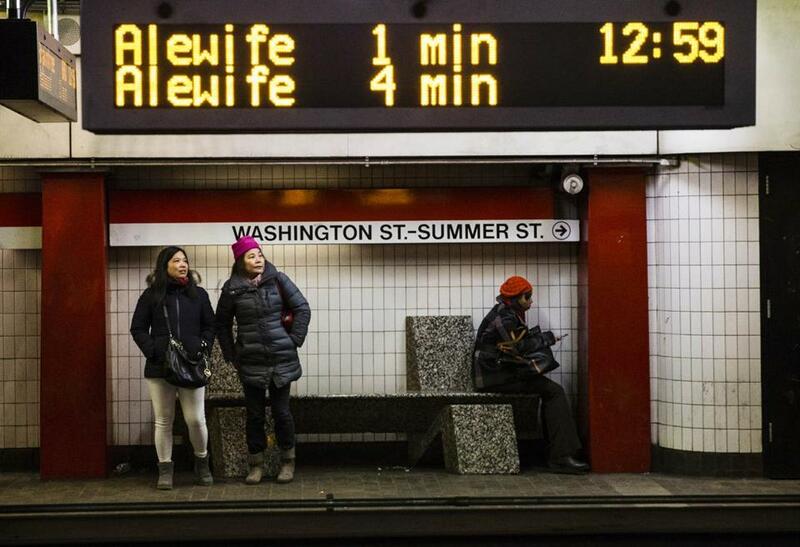 The agency is planning to customize alerts so passengers can sign up for messages specific to where they ride the T. Red Line passengers who travel only from Alewife to Park Street, for example, could turn off alerts for south of that station. Block-Schachter said the T is working with its advertising contractor to use digital advertising displays inside stations to show more information, such as minute-by-minute locations of trains on a map. And the agency wants to fix the countdown clock problem with new software by spring. While officials would prefer to present more accurate estimates, the agency may also simply replace an inaccurate estimate with the letters “DEL” to indicate the train is delayed, Block-Schachter said. “At the very least it won’t say two minutes anymore” for a 10-minute wait, he said.